There we have it, a superb performance from Arsenal as they go top of the Emirates Cup table with nine points, three for the win and six for the goals. Can they finish the job off against Wolfsburg? Come back tomorrow to find out. Until then. What you want in pre-season is to find your team playing at a good pace, with good cohesion. The goals were spread through the whole team which means collectively we are good. Alex Iwobi is a young player who has an ability to create chances and score goals. Overall, we have a good mixture of experienced players and youngsters. "We are open-minded but not in desperate need," says Arsene Wenger when asked if he is in the market for another signing. Also confirms new signing Petr Cech will play tomorrow against Wolfsburg. I first got my opportunity in the Emirates Cup but the youngsters showed what they can do. We finished off the season well so hopefully we can start how we finish. Chelsea did not slip up at all last year so we need to start well. A hiding, a trouncing, a thrashing. Smashed, banged, walloped. 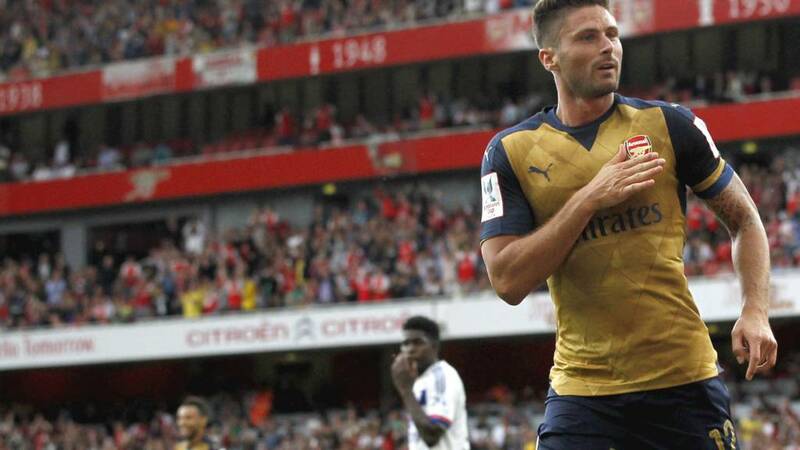 Whatever you want to call it, Arsenal have beaten Lyon 6-0 in the Emirates Cup. Thumped, there's another for you. Arsenal are relentless and still looking for that seventh goal. Theo Walcott is put in by Santi Cazorla but the Englishman's shot is straight at Anthony Lopes. The French side's goalkeeper finally makes a save. All he's done in this match is pick the ball out of the net. Chupa Akpom is through on goal, fires a left-footed shot which rattles the post. Almost seven! This has been a great performance. Smashed for six. Santi Cazorla with a cute free-kick. The wall jumped, so the Spaniard rolls it low and into the net. The French side have been handed a walloping. Alexandre Lacazette smashes an effort wide. He's not had the best of games. Arsenal have not made enough subs today so they decide to make one with 10 minutes to go. Isaac Hayden on, Francis Coquelin off. Going through the motions now, after all those changes. Arsenal happy with what they have got, no way back for Lyon. More changes. Jeff Reine-Adelaide (what a name) and Theo Walcott coming on, Alex Oxlade-Chamberlain and Olivier Giroud coming off. He's has not had much to do today, but when called up Emiliano Martinez has done well. He smothers a low shot from full-back Mehdi Zeffane. Can the French side get a goal? A loud cheer inside the Emirates Stadium. Another goal?? Nope, a Mexican wave is going round. Bit harsh on that players, that. They've provided plenty of entertainment for the fans, bagging five goals. And it's fiveee!! I spoke about Lyon's front three linking well but Aaron Ramsey, Olivier Giroud and Mesut Ozil have been outstanding today. Ramsey and Giroud work the ball well between each other before laying it off to Ozil wide on the left side of the area, who drills a low finish into the bottom corner. A mirror image goal to Alex Oxlade-Chamberlain earlier. A lovely looking goal. Arsenal looking superb! Nearly a fifth. Olivier Giroud showing great technique, hooking a volley from Kieran Gibbs into the sidenetting. It wasn't easy, but it was a typical Giroud effort, positioning his body in such a manner that he can get a shot away on goal. The cliche, "Good touch for a big man" comes to mind. Nice move from Lyon but a poor finish. The front three all involved as Alexandre Lacazette finds Nabil Fekir. He slips it on to Clinton N'Jie but the Spurs target's shot is wide of goal and not troubling the keeper. Lyon captain Maxime Gonalons showing he is made of strong stuff, opting to carry on. Might not be the wisest move if it is going to cause long-term problems for the forthcoming season. This is not good news for Lyon. Captain Maxime Gonalons is now on the deck in a lot of strife. They've already lost Clement Grenier today, they wouldn't want to lose another key man. Alex Oxlade-Chamberlain is looking very sharp for Arsenal, quick movement before playing a low ball into the box. Olivier Giroud is on his heels so Lyon clear the ball. Moments later, he bursts forward before striking at goal but the ball is blocked for a corner. It has been a good day out for some..
Back under way in north London. Can Lyon make a comeback from this? Just to make you aware of what else is going on at the moment. The draw for the 2018 World Cup is currently taking place and the European teams are up soon. Arsenal fans may want to turn away for the next few minutes. Have they ever conceded four goals having been 4-0 up? Oh yes! Rewind back to February 2011 when the Gunners were four goals to the good after 26 minutes, but found themselves 4-4 at full time. Read the match report of how that game unfolded. Youngster Alex Iwobi is given a hug by a couple of his team-mates after that first-half performance. If he keep this up,we'll be seeing a bit more of the lad in the Premier League this season. What a half from the home side. No way will they not win this match. They can't conceded four in the second half, can they?? Francis Coquelin in the book for Arsenal, much to his amusement. Almost a goal pulled back by Lyon. Striker Alexandre Lacazette curls a shot in from the edge of the area, which Emiliano Martinez flaps away. A good save but he could have caught the ball. Nigerian superstar Jay Jay Okocha was a proud uncle last week..
Who is this Alex Iwobi lad playing for Arsenal then? Well, for a start, he doesn't even have is own Wikipedia page. How am I supposed to find out any information on him then! Thankfully, the official Arsenal website have a few words on the 19-year-old. "Born in Nigeria, Iwobi is a talented winger and nephew of former Super Eagles star Jay-Jay Okocha." He must be good! Not as good as Okocha though, he's so good they named him twice. I do not believe this!! This is wonderful stuff from Arsenal, so good that manager Arsene Wenger is up on his feet applauding the brilliance of his men so far. German Mesut Ozil shows his class, holding the ball up on the left winger, before feeding an inch perfect ball into the box for Aaron Ramsey to slide in and finish off the post. Lyon don't know what has hit them! It's an Arsenal runaway train. ANOTHER!! No. It's that lad Alex Iwobi who knocks that ball in at the far post, but he's flagged offside by the official. Arsenal are scoring every time they go forward now. Goals galore. Arsenal are on fire. A dream start for the youngster Alex Iwobi, as the ball comes across to him inside the area, and he stretches to finish with his left foot his into the net. No chance for the Lyon goalkeeper. Arsenal pick the ball up on the edge of the area and within seconds find the net at the other end. Full of pace, as Olivier Giroud is involved once again. He plays it through to Alex Oxlade-Chamberlain on the right side of the box, who drills a low finish into the net. Great stuff. Not good enough? Some of you questioning whether Frenchman Olivier Giroud has what it takes to lead the line for Arsenal and fire them to Premier League glory. On this showing, he looks like just the man. A free-kick is whipped in by Mesut Ozil from the right and Giroud rises highest to head - it actually comes off his shoulder - and into the net. Mesut Ozil shows a burst of pace to find himself in the area, he's found by a superb pass from Aaron Ramsey. A nice backheel to get past the defender, but he falls over when attempting to shoot. The best and worst of Ozil in one motion. Poor Clement Grenier, you have to feel for him, goes off in tears. Nabil Fekir is coming on. Exciting player. Lyon playmaker Clement Grenier is on the ground, writing in pain. No-one was near him and is comes after attempting a left-football pass out wide. It seems like a hip injury and he does not look in any condition to continue. Lyon boss Hubert Fornier is patrolling the touchline, keeping an eye on his troops. Has the look of a golf official today. Maybe he's going for a round straight after this match. Booking for Lyon's Lindsay Rose after going in late on Francis Coquelin. Nothing malicious, just late. Might spark this game into life. A real pre-season friendly thus far, very quiet. Writing the BBC gossip column on an evening means you come across all sorts of players. Lyon forward Clinton N'Jie is one of those, and he has been linked with a £7m move to Arsenal's north London rivals Tottenham. Mesut Ozil attempts an audacious flicked finish but it goes horribly wrong. Still goalless. First chance and it's for the French side. Beautiful play from Alexandre Lacazette on the edge of the box, who flicks a pass - think Dennis Bergkamp when he scored that goal against Newcastle - which falls into the path of Clinton N'Jie. He is through on goal but a fierce left-footed strike is blocked well by Emiliano Martinez. Spanish side Villarreal are currently top of the Emirates Cup with five points after beating German side Wolfsburg 2-1. No, I've not gone mad. The format of the tournament means not only do you get three points for a win, but you get a point for every goal you score. No chance of the teams sitting back today then. Attack, attack, attack! Neither keeper has been tested yet though. It's so hot out there that the Arsenal goalkeeper Emiliano Martinez is wearing short sleeves. Not a fan of that, I always went with the long sleeves. Talk is that Polish stopper Wojciech Szczesny is on his way to Serie A side Roma. No chances to speak of so far. Arsenal knocking it around nicely so far, just getting a feel of the ball. Fans applauding every, little flick so far. They'll soon settle down. Arsenal in their changed kit of gold tops and black shorts. Looks smart. Lyon in all white. Fine in summer, but they'll get a bit mucky in winter. We are under way at the Emirates Stadium. For me, the signing of goalkeeper Petr Cech is a game-changer for Arsenal. They were missing a leader at the back who can add some calmness and composure to the back line. So, after finishing third last season, how will the Gunners do in 2015/16? Can they mount a serious title challenge? I think they will be there or thereabouts come May. Get in touch using #bbcfootball, leave a comment on the BBC Facebook page or text in on 81111 (UK only). Remember to put names on those texts. The teams are in the tunnel and it's a scorching day in north London. The pitch is in pristine condition so we should see some slick, free-flowing football. Things didn't quite go to plan for Arsene Wenger's side last year as they missed out on winning their home tournament. A 1-0 defeat against Monaco gave the title to Spanish side Valencia. A certain Radamel Falcao was the match-winner in that game. For him, an unhappy season was to follow, as we know..
New signing Petr Cech is on the bench for Arsenal and hat-trick hero in Singapore Chupa Akpom will be sat beside him. Youngster Alex Iwobi gets a start for the Gunners. Lyon's dangerous striker Alexandre Lacazette starts, as does playmaker Clement Grenier. Ligue 1 Young Player of the Year Nabil Fekir is a sub. Not too long ago, Arsenal were celebrating winning the FA Cup at Wembley, but pre-season ramps up today as they return home to compete in the Emirates Cup. Today's match against Lyon will go a long way to seeing who could feature for Arsene Wenger's side in the Community Shield against Chelsea on Sunday, 2 August.